RENO, Nev.-After an explosive opening to the 2011 season, Reno Aces outfielder Wily Mo Peña was named Pacific Coast League Player of the Week, the league office announced today. Peña has quickly asserted himself as one of the premier power threats in the PCL, homering in six of his first eight games this season, and driving in 14 runs. Entering play today, Peña is batting .429 (15x35) with 13 runs scored, and has hit safely in all nine games in which he has appeared-including five multi-hit efforts. Peña goes into Monday's action tied for the Minor League lead in home runs. He's ranked fifth in the PCL in batting average, tied for third in RBIs, first in slugging percentage, second in runs scored and third in total bases. Peña is homering at a rate of one per every 5.83 at-bats this season. The 6-3, 280-pound native of the Dominican Republic becomes the fourth player in Aces history to receive a weekly honor from the PCL. 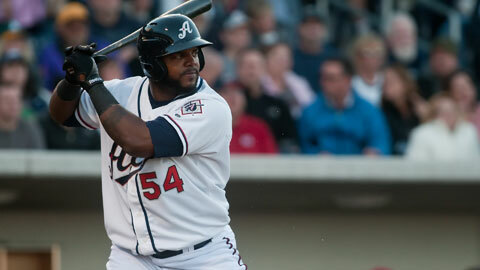 Brandon Watson and Carlos Corporan received Player of the Week honors in 2009 and 2010, respectively. And last season Josh Collmenter was named PCL Pitcher of the Week. Tacoma's Chris Seddon was named PCL Pitcher of the Week today. Peña and the Aces are in action tonight at Aces Ballpark at 6:05 p.m. PT. Tickets can be purchased at the Aces Ballpark Box Office, online at www.RenoAces.com or by phone at (775) 334-7000. Discount full and partial season ticket plans are available today. Visit www.RenoAces.com or call (775) 334-4700 for more information.